Letters to a Young Librarian: Shuffling Priorities, Or, How Will I Ever Get Everything Done? 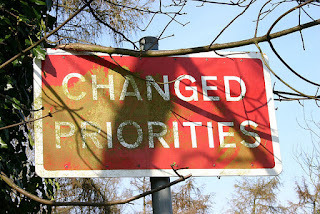 Shuffling Priorities, Or, How Will I Ever Get Everything Done? Creative Commons licensed picture by hockadilly. My personal life, off the 'net and outside of work, has taken up the majority of my attention and time lately. Now that things are returning back to normal [insert the superstitious gesture of your choice], I'm facing the daunting task of shuffling my priorities and getting my To Do list back to a manageable state. This reshuffling is made even more problematic because it's the beginning of the academic year, with all the attendant responsibilities this time brings. One further complicating issue is that I've renewed my commitment to keeping my stress low since part of what kept me out of work was a nasty strain of penicillin resistant strep throat - something that probably wouldn't have hit me as hard (if at all) if my stress levels & amount of sleep had been where they are supposed to be. Hard deadlines will be considered first. Class sessions can't be reschedule just because I'm feeling overwhelmed and need a moment to catch up. Likewise with meetings where I'm on the agenda, but where I'm only one of a large group. Projects that impact my community, particularly first semester freshmen, are also a high priority. Even ongoing projects that fall in this category will be placed higher on the list than most of what I have to do, since we are a teaching/student focused college. Things I'm doing that are for members of my faculty are also very important, since by supporting the faculty I am supporting the students. Library-specific projects, things I've promised to my coworkers, will come next. It's okay to put some of these on the back burner, but I don't want projects like revamping maps of the different floors of the library to fall completely off the list. Personal work projects will come last. That article I'm planning to write about the email focus groups I run? On hold for the foreseeable future. Same goes with catching up on my professional reading. I hate that these kinds of projects are always the first thing to be set aside when crunch time hits, but I have to leave something out for a while and the needs of my community have to come first. So there's my basic approach, all spelled-out. I still have to go through the process of applying this plan, figuring out the specifics, but so long as I keep my higher-level priorities straight, I know the specifics will fall in line. How about you? 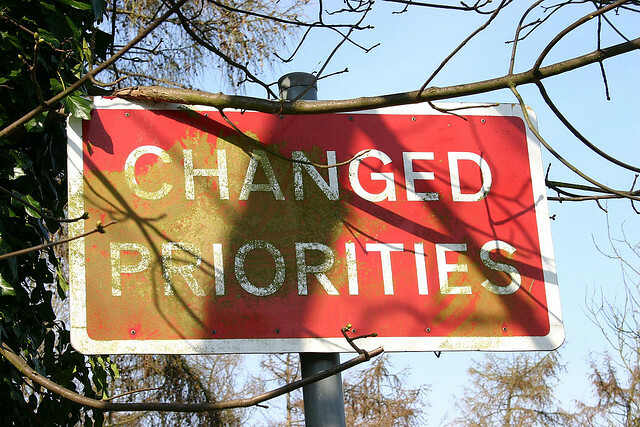 How do you set work/school priorities? I wish I were as organized as you. My process is more "pay attention to what's in front of me and try to set myself reminders for stuff that's due in the future so I don't forget them completely." I envy your clear-eyed assessment. I think this is one of the most challenging things about being a research/reference services librarian. It's difficult to manage or anticipate your workload because the often last-minute needs of your patrons take priority over whatever else you were hoping to get done. My process looks a lot like Helgagrace's. On Friday afternoons, I'll write out a to-do list for the next week, then each morning I'll decide on the three things I need to get done that day in order to go home feeling productive. Then five lit search requests come in and all of that goes out the window, but I'm putting my community first, so it's all good :) Hope you are feeling better soon.